This par 4, 171 meter hole is cunning and difficult. We call it ‘The Funnel’, because it starts out narrow at the tee and widens out like a funnel, going downhill at first and then back uphill. At that point, you have a choice to go Left Wing, Right Wing, or Centre (OK, maybe we should call it the hockey hole!). 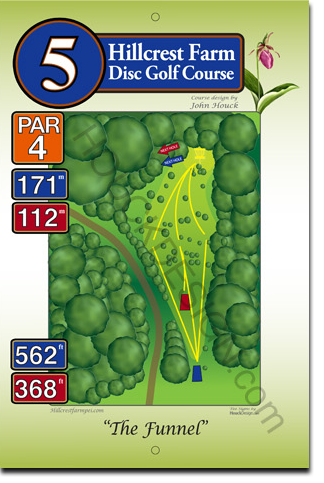 Any choice is tricky, as the fairway behind is divided into many fingers all leading to the basket near an ancient tree we’ve nicknamed ‘Home tree’ (OK, maybe we should call it the Avatar hole!) Take your pick!